You’ll be impressed with how effectively it works. Do you think that vinegar is only for cooking? Well, if you’re not aware, it’s great for cleaning! In fact, it’s the top ingredient in green cleaning as you can easily clean over 90% of your house with it safely and effectively. Not only that, but you’ll be surprised with how many products you can replace and how much money you can save by giving it a try. Vinegar is definitely considered the “mother” of green cleaning products. (It has several other amazing uses, too, such as being able to kill weeds.) It’s very eco-friendly and great at disinfecting the bathroom and kitchen and for sanitizing things like sponges. Studies have been done showing that it is effective at killing E. Coli and even the H1N1 flu virus. So, rest assured, you know when you clean with it that all those little germs are getting eliminated! Just be sure to let it sit for a few minutes before rinsing it off, so that the vinegar can do its job. You’ll be able to ditch a host of conventional, chemical-laden products, if you give vinegar a try. Say good-bye to toxic toilet bowl cleaners (use straight vinegar instead), all-purpose spray cleaners, window cleaners, rust and lime removers, soap scum cleaners, air freshening sprays, mold and mildew sprays, floor cleaners, and more! 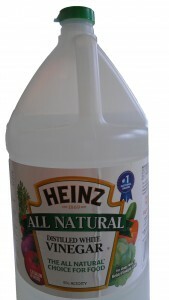 Instead of all those products, simply whip up a simple vinegar-water spray or this All-Purpose Aromatic Vinegar Spray. Vinegar is great outdoors, too. Zap the scent of an ant trail with it and even kill weeds without resorting to toxic herbicides. Another benefit of vinegar is the cost. It’s well under a dollar per cup, and you’ll save even more if you buy it a large bottle. Plus, here’s my favorite part — you only need one thing to do most of your cleaning, which means faster, more efficient cleaning. How can you resist? You can’t. So why not pull out that bottle of vinegar that’s been sitting in your kitchen cupboard and put it to some good use? One more thing. You’ll notice initially that vinegar leaves a distinct smell, but I promise you that it will dissipate and leave you with a clean, fresh smelling house. (Leaving a window open while you clean is a good idea.) If that doesn’t work for you, add in some essential oils to your vinegar cleansers. They will smell wonderful and add additional benefitis, such as proven antibacterial, antifungal, and antiviral properties, to your homemade cleaners. Photos © Karen Peltier and Well Gal, 2012 – 2014. Undiluted vinegar can cut through grimy residue in most situations by letting it sit for several minutes. Tougher grease build-up can be removed by sprinkling baking soda on a damp cloth. Hither Green Carpet Cleaners Ltd. Absolutely love cleaning with vinegar! Never thought of adding lemon or lime juice, a must try! Thank you!